A version of this article appeared in the South China Morning Post May 5, 2014. China’s officials, mouthpieces, and supporters should know what he was talking about. Their thinking is that if they accuse foreign powers of “intervening” or “meddling” in Hong Kong’s affairs often enough, people will start to believe it. 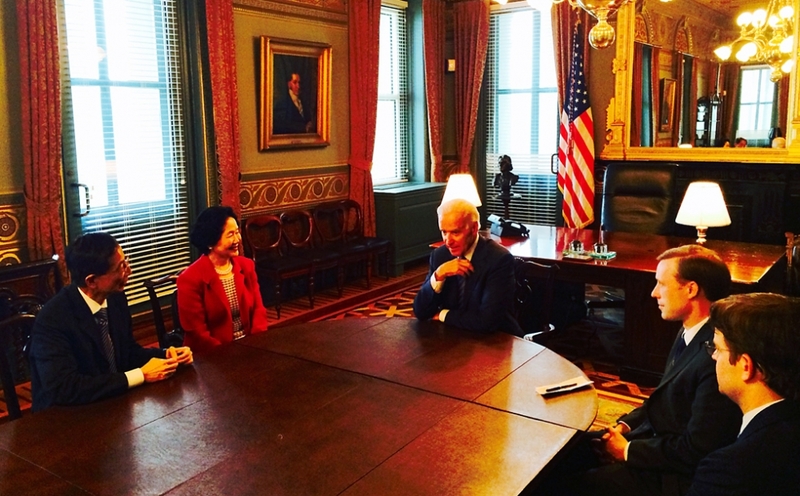 Beijing’s recent complaints about US Vice President Biden’s meeting with two stalwarts from Hong Kong’s democracy camp were the latest in a long litany of accusations of “US meddling” in Hong Kong’s affairs. As in the recent case, China’s attacks follow a predictable pattern. They fly fast and furious anytime a US official or politician utters even the most innocuous statement on Hong Kong’s political development or a member of Hong Kong’s “opposition” meets with a US official. The problem is that the harangues have become so formulaic and shrill they have lost any meaning or connection to real world events. Foreign governments usually laugh them off. The attacks remind both Hong Kongers and the international community that China still has miles to go in developing a sophisticated soft power diplomacy, even in its own backyard. But more than anything, the finger pointing represents a double standard. Just scan the various official websites of China’s diplomatic missions around the world and you will see Chinese officials doing their job. In the US, they are meeting with business leaders, community representatives, and opposition and ruling party officials from the halls of Congress to city hall. US is told to keep quiet on Hong Kong’s elections. On another, the Chinese Consul General in Chicago is shown meeting earlier this year with US Representative Kerry Bentivolio, one of the Republican Party’s staunchest conservatives. Known for his anti-Obama positions, Bentivolio made himself famous last year for declaring, “it would be a dream come true” if he could write a bill to get President Obama impeached. Whether intended or not, Beijing seems to be saying that it’s ok for its officials to meet with opponents of the US president, even those calling for his removal from office, but if a US official wants to meet with a Hong Kong pan-democrat, even those no longer holding any official position, it is to be condemned. And the Chinese government is no stranger to commenting on other countries’ internal affairs. China now issues its own report on alleged US violations of human rights, which earlier this year accused the US of having a poor civil rights record, lack of press and internet freedoms, and a growing income gap. Beijing has similarly shown no shyness in criticizing the US for its budget problems and trade policies. But none of this has lessened China’s own long-held paranoia about “foreign meddling” in Hong Kong, which reached a high point in 2010 after Wikileaks released hundreds of US diplomatic cables from the US Consulate. Far from showing the US interfering in Hong Kong’s affairs, the leaked cables simply documented what diplomats from every nation do – work to foster better relations, meet with officials and citizens from all walks of political, economic and social life, and seek areas for greater cooperation, while trying to minimize conflict. If that is “meddling,” then China’s officials in the US might want to be doing a bit more of it themselves. The future of US-China relations depends on it.